Alex Barbary (centre) in action for Horsham YMCA in their 4-0 away win over Eastbourne United earlier in the season. Picture by Jon Rigby. Horsham YMCA need to 'keep wracking up the points' if they are to achieve their dream of Premier Division promotion according to boss Peter Buckland. YM extended their unbeaten run to nine games after last Saturday's 4-2 away win over Lancing, securing their place in second in the table for at least another week. Third-placed Newhaven, who thrashed East Preston 5-0 away from home at the weekend, are just a point behind the Gorings Mead-outfit but have a game in hand over their promotion rivals. The two sides will meet at Haven's Trafalgar Ground on March 30 in what will be a pivotal match in the race for second. Buckland is aiming to continue YMCA's undefeated streak when they host second-from-bottom Eastbourne United in the league on Saturday but he joked that Lady Luck may desert them come the season's end. He said: "We're still sat second in the league but we're taking nothing for granted. "If you looked at it and did your sums, and everybody won their games, we'd end up third. "Second is our target and we would need to turn Newhaven over to be able to achieve that, as well as winning all the rest. "A few weeks ago we knew that it was win or bust. We had to win loads of games back-to-back. "Other than the high-risk factor of goal difference, I think we should just keep wracking up the points a game at a time. "Knowing our luck we'd miss out on second-place by a goal scored or something outrageous like that. "I think if it came down to that, that's just one of those things. You can't really control that." Saturday's opponents Eastbourne United picked up a vital 2-1 victory over YM's near-neighbours Loxwood last weekend to boost their chances of Premier Division survival. Arron Hopkinson's appointment at The Oval on December 17 has sparked a revival at United. Languishing at the foot-of-the table with a mere two points on his arrival, the Whites have since picked up 19 points to move them up a place and a goal away from the drop. 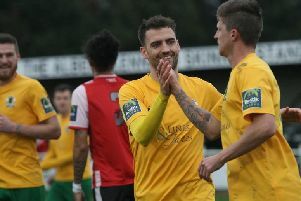 Their cause has been further boosted by the capture of prolific former Horsham and Lewes forward George Landais from Bostik South East side East Grinstead Town. Buckland is predicting a tricky test against a rejuvenated United and is wary of the goal-scoring threat of Landais and an ex-Horsham YMCA player. He added: "They've signed George Landais who's an experienced player so their starting two up-top will be Sam Schaaf, with a point to prove maybe, and George. "They're absolutely fighting for their lives and it's probably going to be more difficult than the Lancing game. "I do believe that it's really going to be a battle."